I’ve been keeping a secret. MY SISTER IS EXPECTING! 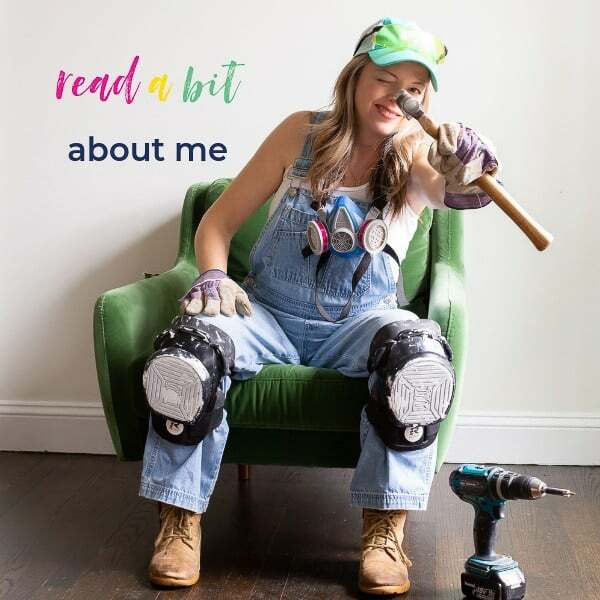 She’s finally given me the green light to share the news with you. I’m over the moon about becoming an aunt again! Ahhhh…it will be so fun having another baby in the family. We all love babies, right? Personally, I love babies even more when I’m NOT the one wearing the maternity jeans 😉. My sister lives on the coast, and she’s planning on a nautical nursery. 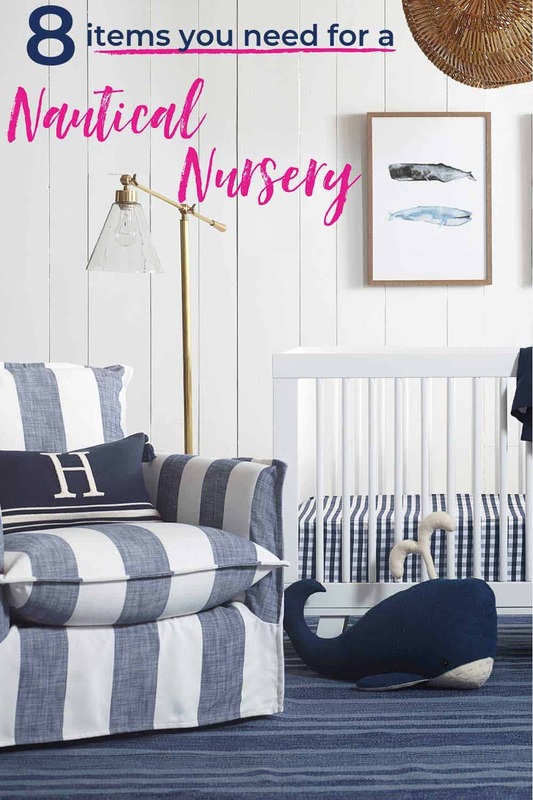 And I’m guessing that if this post caught your attention, there’s a chance you may be thinking along a nautical nursery line as well! The blue and white palette is serene, and loved by both children and adults. It’s one that will grow with your baby. It’s gender-neutral. I know that many people consider blue to be a “boy” color, but denim is universal, and so is the coastal aesthetic. So this look is perfect for a little lady as well as a little guy. There are tons of decor options available for a coastal nursery / nautical nursery theme. Expecting a little one is so exciting. It can also be emotionally taxing and physically draining at times, too. I completely understand, having been there several times myself. I remember how overwhelming it was to plan out a nursery, so I’m thrilled to partner with Serena & Lily to share my nautical nursery essentials with all of you beautiful, expecting moms (my sis included)! No one does nautical and coastal better than Serena & Lily. 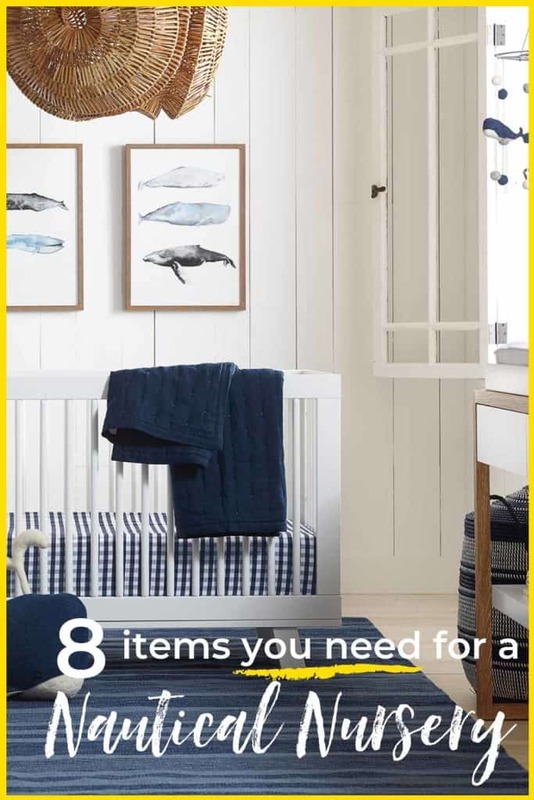 With the help of amazing items in their newest collections, I’ve condensed your nautical nursery needs down to 8 essentials. So let’s get started! 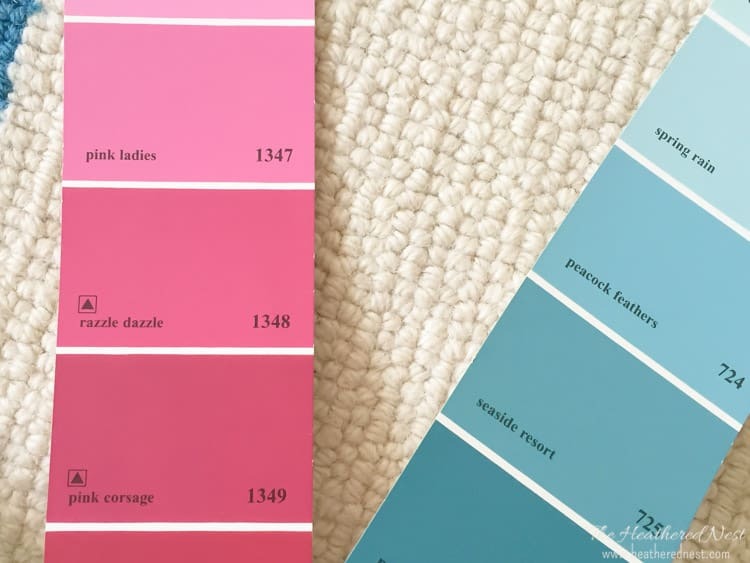 We’ll make this nursery plan a (sea) breeze! Nautical Nursery Essential #1: A Boatload of Baby bedding and blankets. 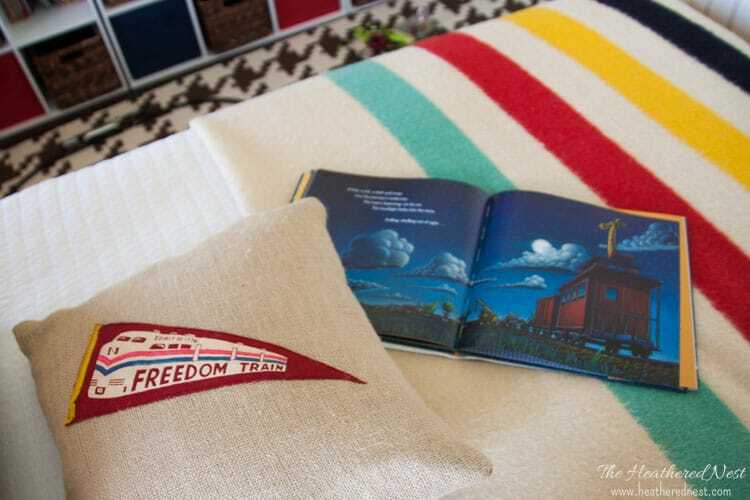 One of the easiest, most cost-effective ways to add a nautical nod to the nursery? Bedding and blankets. 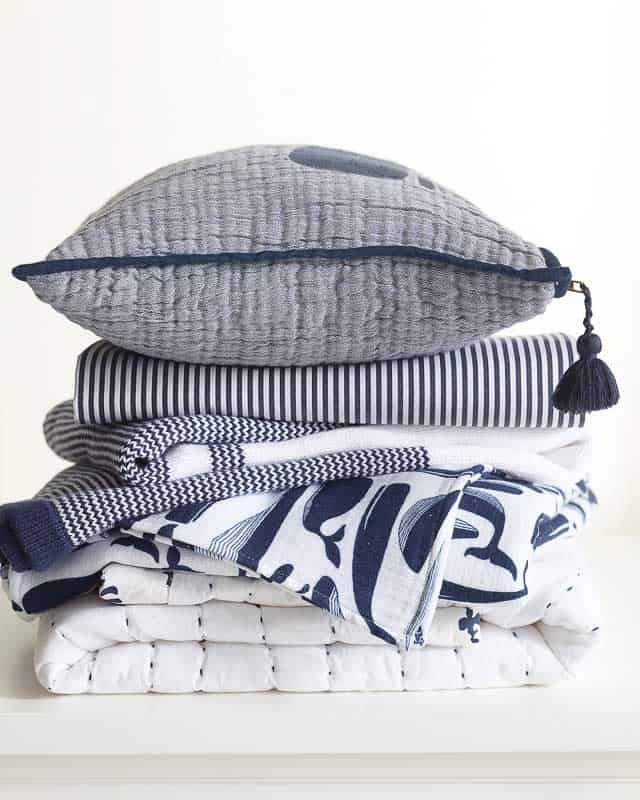 From coastal stripes to solids, sailboats to gingham, there are bunches of bedding and baby blanket options to fit in perfectly with your nautical nursery theme. 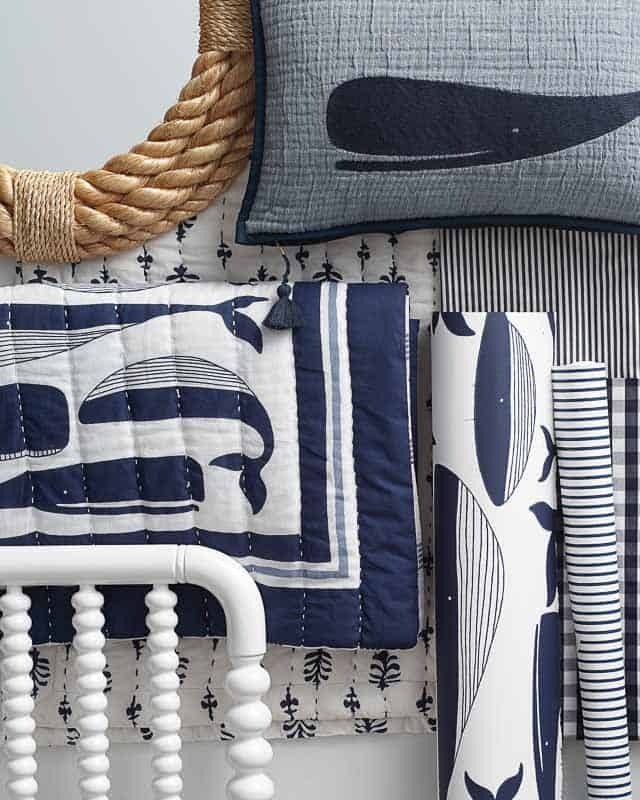 Nautical Nursery Essential #2: A coastal-cool crib. The cane side panels add a great natural element that reads beachy. It’s subtle perfection. And buying a convertible option is smart because it lasts your child years longer than a regular crib. Why? Because it transitions from crib to toddler bed, and finally to a daybed. With a mid-century modern vibe, this white and wooden crib is neutral, sleek and stylish. Serena & Lily also pairs a reinterpreted vintage spool-style crib with a lot of their nautical nursery decor. It’s another gorgeous crib to check out. 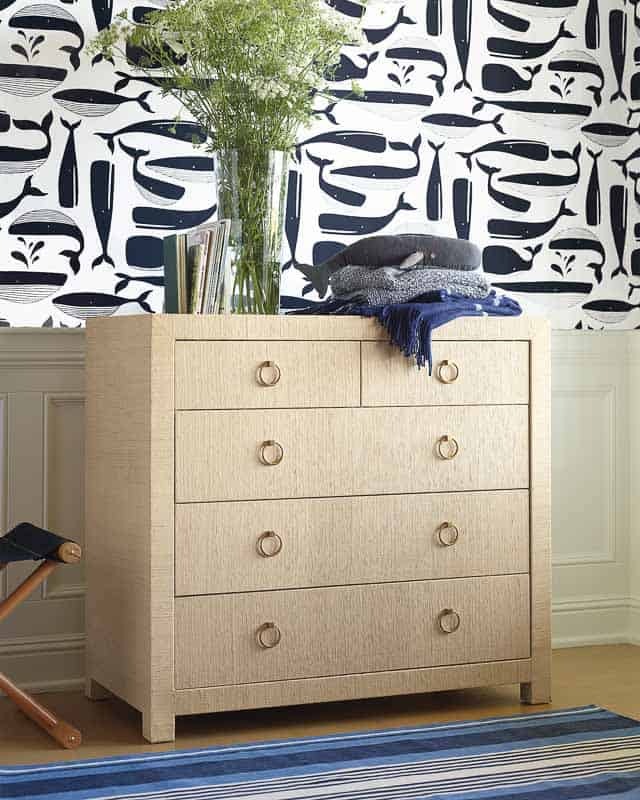 Nautical Nursery Essential #3: A changing table to keep baby high and dry. The Harbour Cane Crib has a coordinating changing table that is lovely. Caning has a distinctive beachy look and feel. On this changing table, the cane material is featured again, but this time as two open shelves. You certainly don’t HAVE to go matchy matchy with your crib and changing table. But on the other hand, one less decision is kind of nice. 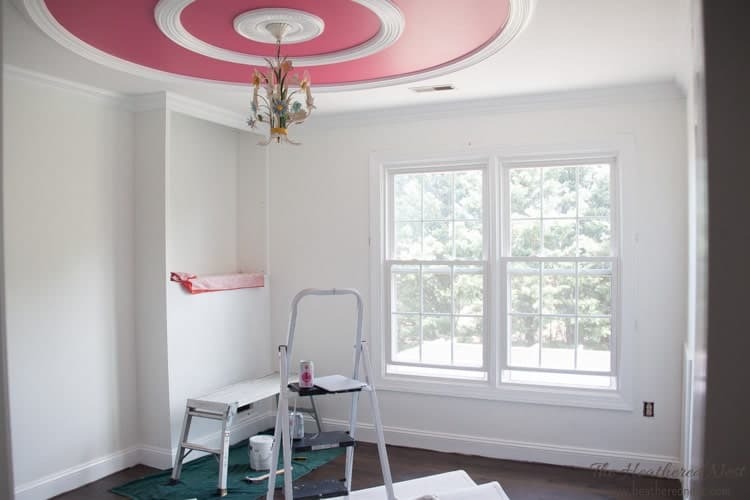 Especially when the furniture is this pretty! Nautical Nursery Essential #4: Rock the Boat Baby in a Wave-worthy Rocker/Glider. You definitely need a good place to sit in a nursery. Midnight feedings, a comfy spot for reading time, a place to rock and sing lullabies…a chair of some sort is key. 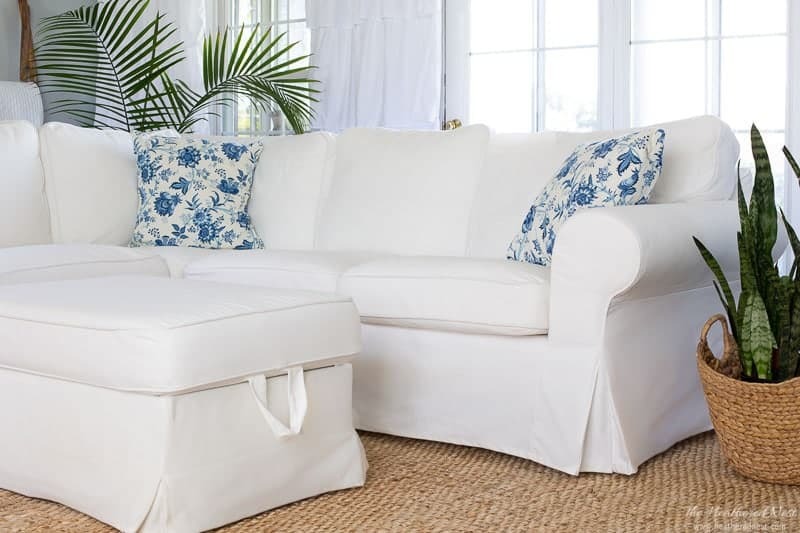 For a coastal cue, think of going with a crisp white rocker. Scared of all-white? Opt for a different bold-beachy statement like blue and white stripes. Often we are told we need a rocker/glider in a nursery, but I don’t think that’s an absolute must. We had a rocker for our first baby, but opted for a bigger, lounge-like chair for our 2nd which also worked great. chaise lounges, and the daybeds that are showing up everywhere lately. 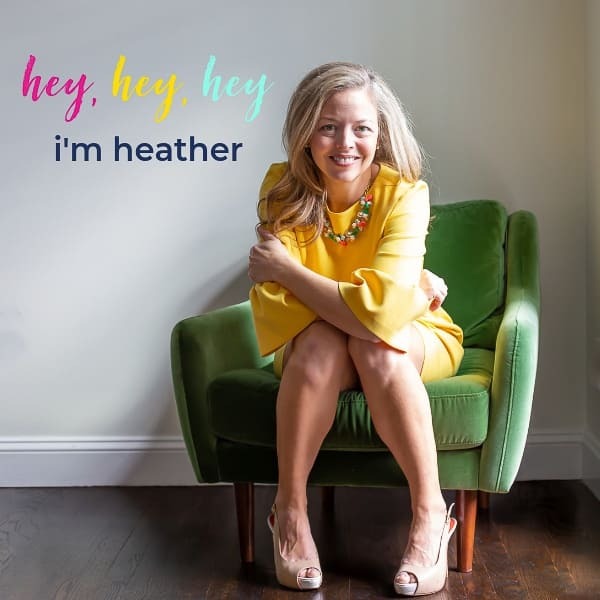 The great thing about a piece like a chaise, daybed or hanging chair is that they can work in ANY room in the house, long past the need for a nursery. I can only imagine how much kids and teens would love having a hanging chair. I’d love one, too! Nautical Nursery Essential #5: Storage To Keep You Sailor’s Space Ship Shape. The smaller the kid, the more stuff they need. Odd but true. 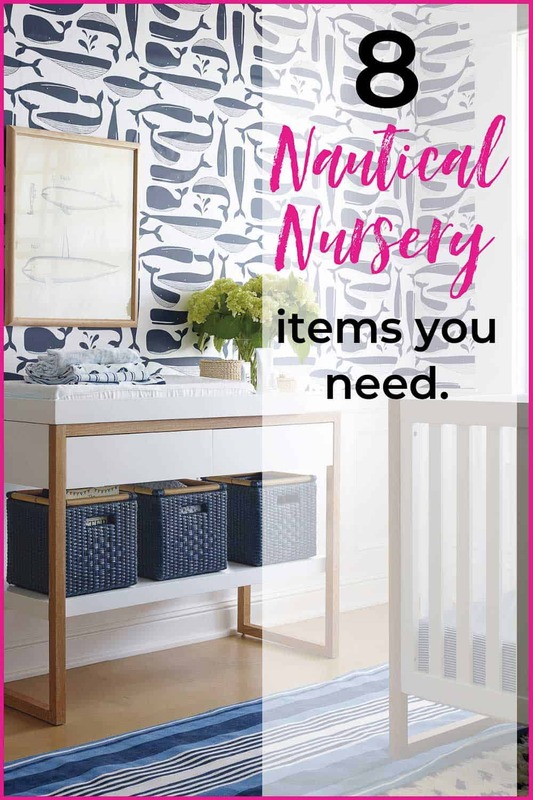 So when designing your nautical nursery, make sure to include LOTS of places to store things. Think books, rattles, toys, booties, pacifiers, diapers, hair bows. And that’s just the beginning. 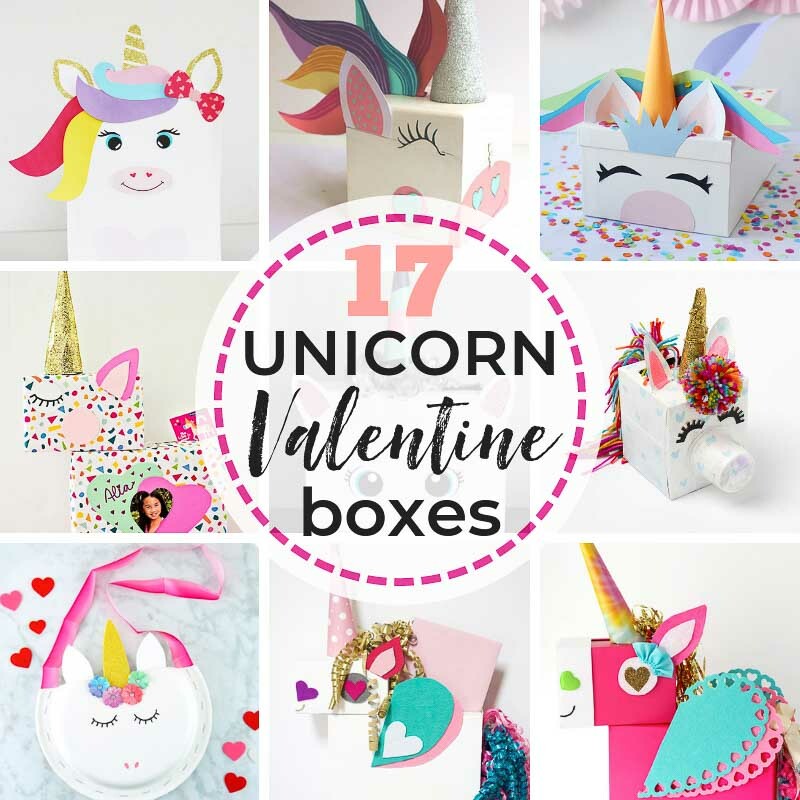 Since you need bunches of it, your storage might as well be beautiful. 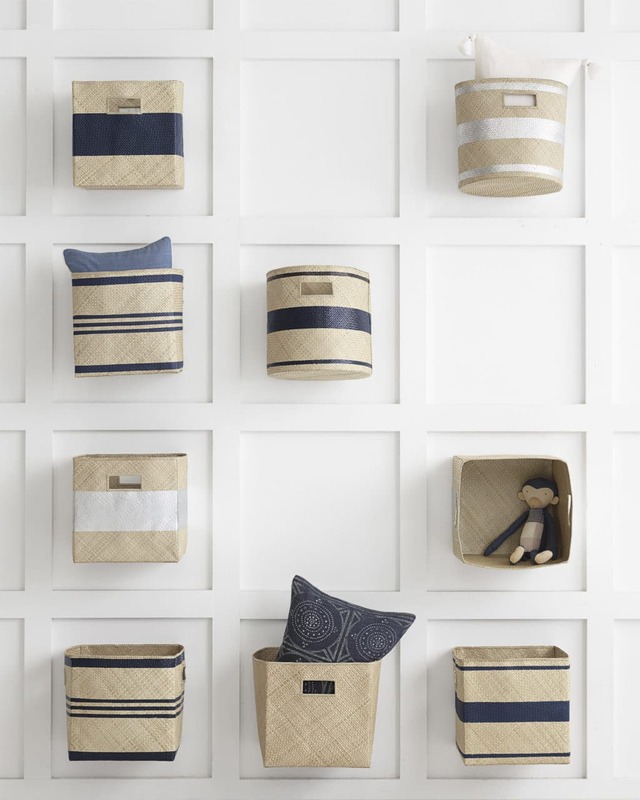 From natural fiber baskets to woven palm bins, Serena & Lily has many great storage options to fit perfectly with your nautical nursery theme. 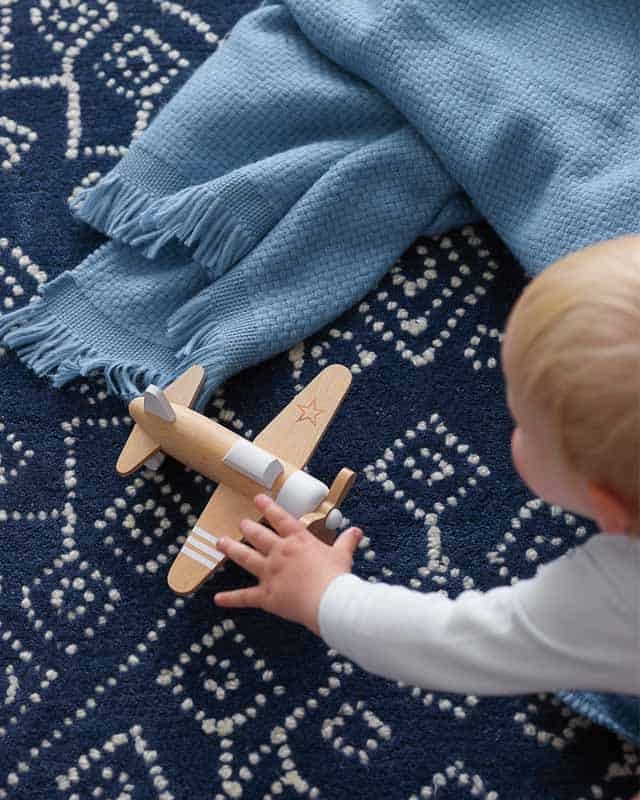 Nautical Nursery Essential #6: A comfy rug for when all hands (and knees) are on deck. Comfort in a nursery is paramount. And that includes what is beneath your feet – or hands and feet if you’re in the under 1-ish crowd. Something with pattern is a plus. Not only does pattern give baby’s eyes something interesting to focus on, but it also adds dimension and helps hide spills, spit-up and any other child-induced stain. 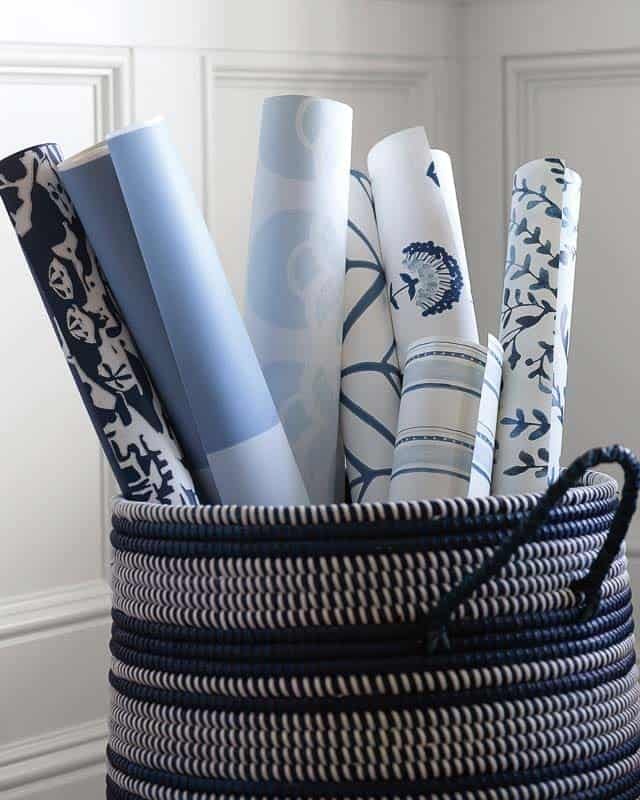 For a nautical nursery, obvious choices are stripes, and/or anything blue. A thicker, higher pile wool rug is a smart, soft option for bare baby knees. Plush, fluffy rugs scream for some quality tummy time. OR layer two rugs for a richer look. Try a natural fiber jute rug with nautical overtones, coupled with an indoor/outdoor performance rug which will be more comfy for crawlers. Nautical Nursery Essential #7: Lighthouse chic lighting. There isn’t any brand out there that holds a candle to Serena & Lily as far as coastal light fixtures goes. 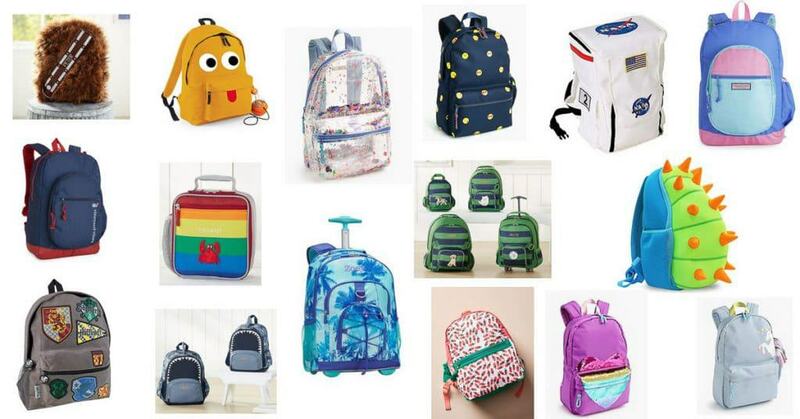 I want alllll of them. The pendant light shown below is one that we bought for our closet renovation. Nautical Nursery Essential #8: Beachy Keen Art & Wall Decor. 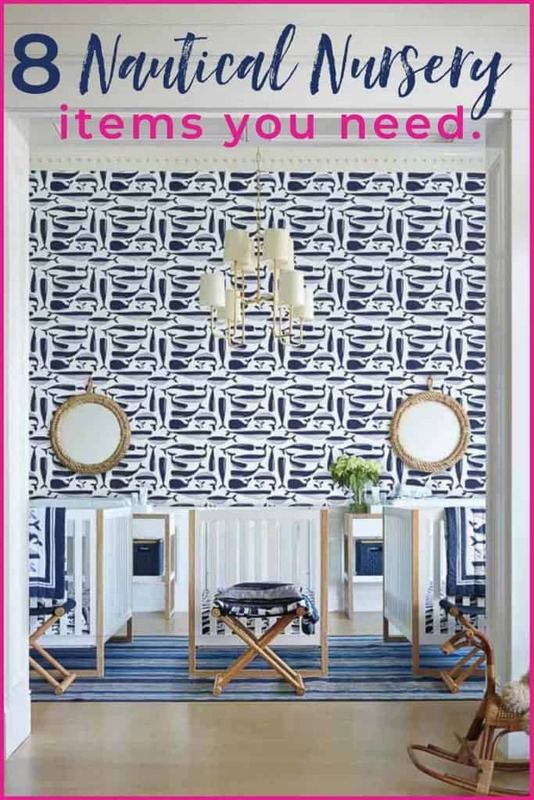 This is where the real decorating fun begins, and your nautical theme can truly be brought to life! 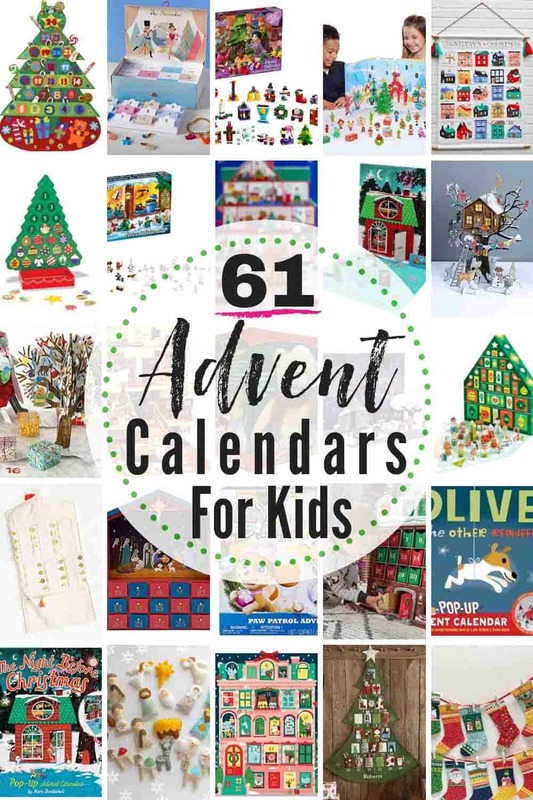 Bring in coastal-inspired decor to dress the walls, pillows with octopi, or other sea creatures to plunk down on chairs, a wooden toy boat to tie in the theme, and mobiles for little eyes to wonder at. 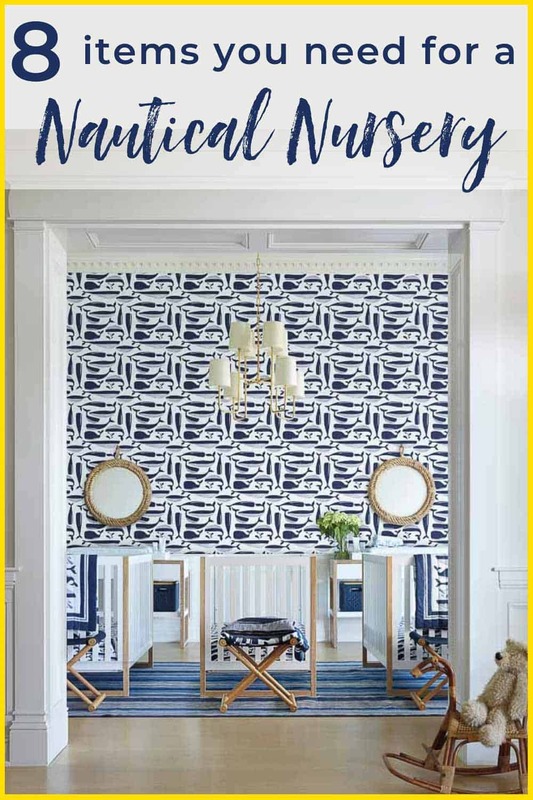 For a nautical nursery, I think my favorite decorative item offered at Serena & Lily is their bold, punchy and preppy whale wallpaper. Scared of wallpaper? Start small and cover just one wall. An accent wall behind the crib always looks great, and gives your eyes a great place to land when entering a room. Whales not your baby’s bag? 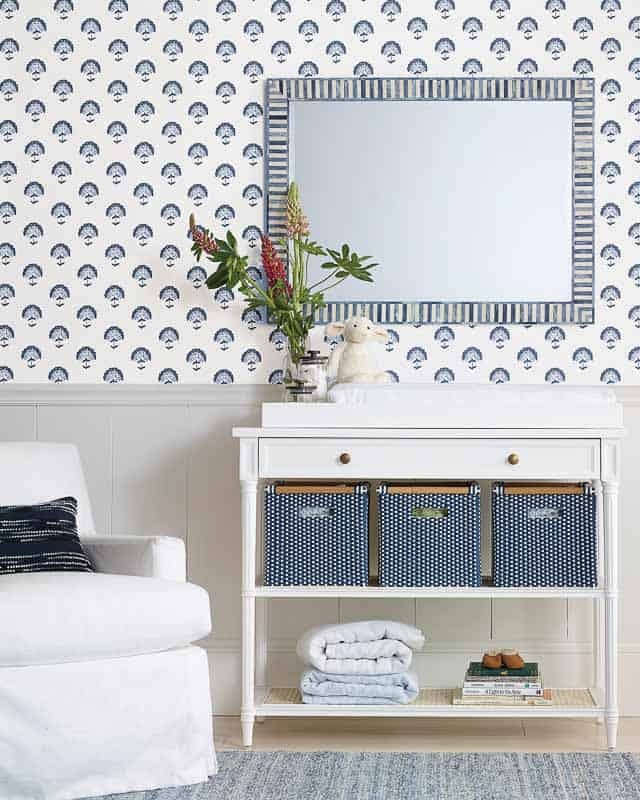 How about the coastal toile? Wall art is another fun thing to shop for. 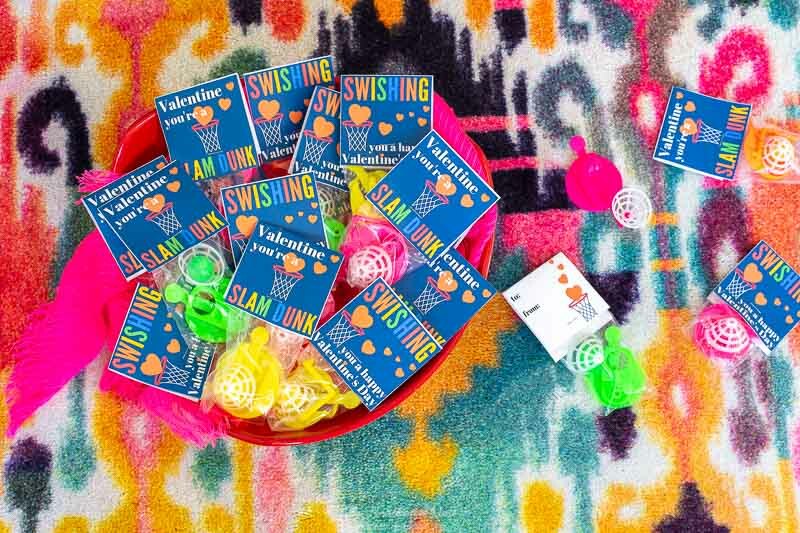 Serena & Lily has new options including a friendly octopus, a collection of sailboats and a bunch more nautical nursery-friendly prints. And I’m over the moon for their plushy whale mobile. It’s just the sweetest, softest piece. And now, with the new sailboat sheet on, and the sweet pom pom embellished baby blanket hung expectantly on the side of your beautiful cane-sided crib, things are looking perfect in your new, nautical nursery. All you need now is your little sailor to come home! Best of luck to you and your family during this exciting, tiring, and absolutely wonderful time ❤️.